It’s got to be one of those ultimate bucket list travel numbers. A top 10 hit for sure! At least I know it was one of mine. And thankfully I can say gorilla trekking in Uganda, lived up to each and every expectation I had. From the amazing images I captured, to the stunning rainforest hike, to the experience of staring one of our closest relatives straight in the eye, it’s going to be hard to put into words just how incredible seeing the gorillas in Bwindi Impenetrable Forest was. But I’ll give it a try! I finally g0t to fulfil my dream of seeing gorillas in the wild as part of the 2 month adventure overland trip I took through most of the countries of Southern and East Africa because, of course, you really can’t pass through Uganda and not take the time to do some gorilla spotting can you?! 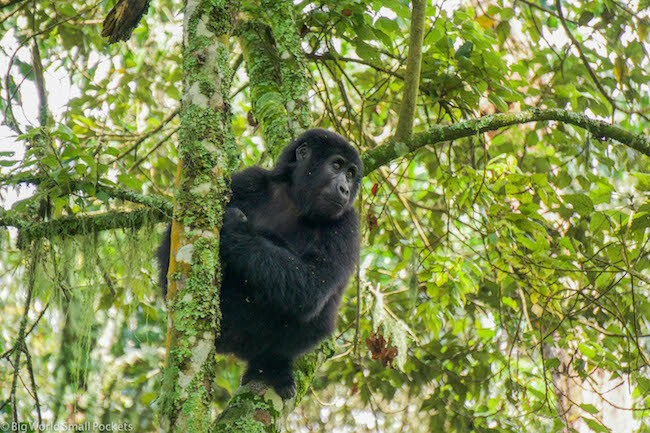 So yes, as soon as we crossed the border from Rwanda into Uganda, we made a beeline for the incredible Bwindi Impenetrable Forest and its prime gorilla territory. The gorilla trekking took a full day and I was glad we arrived in the town of Kisoro, near Bwindi, at lunchtime the day before. This gave us plenty of time to get everything ready we needed, as well as a good night’s sleep, because it was an early start the next morning. Driving from our accommodation to Bwindi before sunrise, we got to see day break as we ascended above the clouds along a bumpy dirt road. After an hour and a half, we finally arrived at the national park and were then split into smaller groups of between 6-8 people, assigned a guide and a gorilla family – name and all! Each guide, we found out, works with a set pair of trackers – who had already started hiking into the forest at dawn to locate the family we were going to visit. Well that’s the hard work done we thought! Our particular gorilla clan seemed to be the furthest away from base camp because we certainly hiked the longest of all the groups! Telling ourselves this was because we looked like the youngest and fittest group (HA HA!) the hike, through strenuous, really added to the whole experience. Indeed, we ended up trekking about 4 hours through the rainforest to get to the family (plus 3 hours back!) and at some point actually crossed over an invisible border into neighbouring country, the DRC… or so the Vodafone alert on my friend’s mobile told us! The hike was hard and humid, with plenty of fire ants and slippery mud paths to contend with, but the views, at times, were hard to beat as we ascended higher and higher and deeper and deeper into the forest. 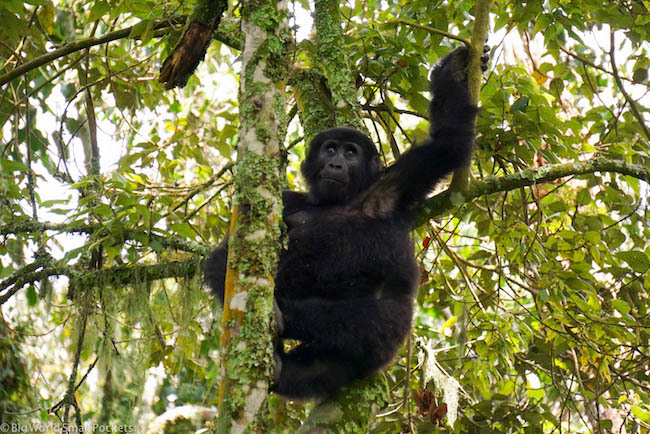 We also had 2 scouts with us, as well as the guide, so it felt very safe and well organised – especially as the escorts had guns, namely to protect us from the more dangerous animals that live in Bwindi including buffalo and forest elephants. Once we were getting close to the gorillas, the guide then warned us to put down our backpacks and get our cameras ready – we were about to get our precious 1 hour with these giants of the jungle. I don’t ever think 60 minutes has passed so quickly in my life. Yes we saw family of 10 gorillas, including a very active male silverback! 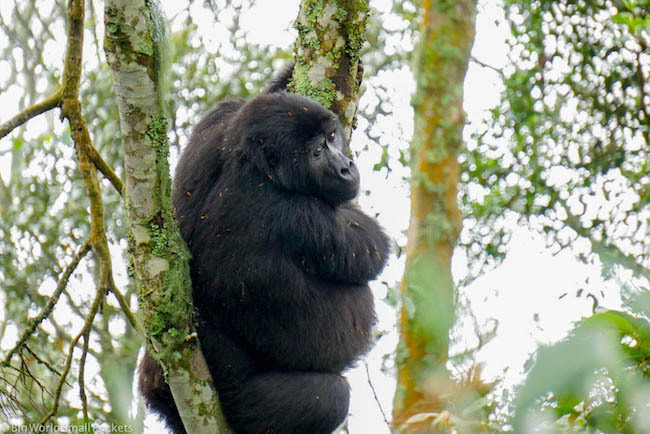 From spotting the female gorillas with their babies, to watching the youngsters play in the trees to being charged by the silverback, it’s safe to say we got the full gorilla experience! What really struck me was how expressive these animals were, and how many “human” characteristics they displayed including farting and even thumb sucking! It was even hard to take photos sometimes, mesmerising as it was coming so close to a family of fellow primates. Yet remember to snap some photos I thankfully did… and you’re looking at them right here! Without a doubt, this was one of the most magical hours of my life… and I even got a certificate to prove it! So, as I’ve said, my gorilla trekking experience took place in the Bwindi Impenetrable Forest – a UNESCO-listed national park located in southern Uganda. It’s unsurprisingly one of the top 5 Uganda safaris I recommend! It’s also one of the most popular places to see gorillas, given it ranks among the cheapest. Of course, that’s the cheapest of just a few places on earth because gorillas’ habitats are very specific to this central area of East Africa and these animals are highly endangered as a result. 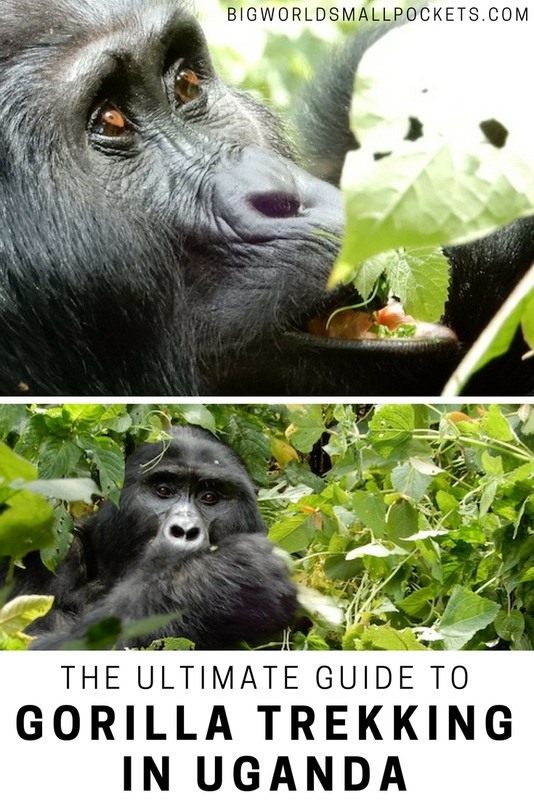 Outside of Uganda, you’re able to see these amazing primates in both Rwanda and the DRC… but that’s about it! 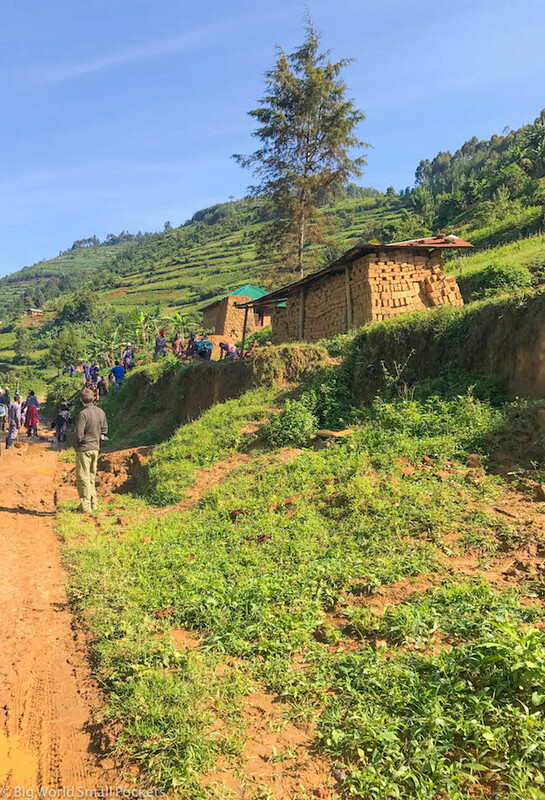 I’d highly recommend the service we got in Bwindi Impenetrable Forest because, although I can’t compare it to the other locations, the hike included some lovely scenery and the rangers, guides and trackers all seemed to be very well organised. In addition, it was great to learn about the conservation policies being heavily maintained in this park and how tourism here is providing a valuable and sustainable income for locals. I was particularly delighted to see our guide was female and to therefore know that opportunities for work in this park and industry are ostensibly open to all. LOOKING FOR A BUDGET TOUR OR SELF-DRIVE TRIP IN UGANDA? 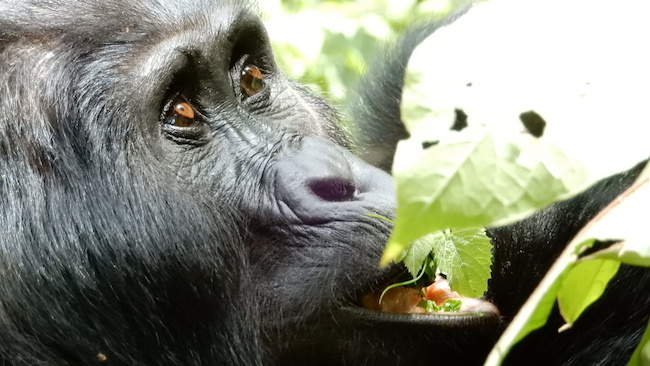 If you’re interested in an unforgettable, well-priced tour in Uganda with guides you can trust, or a self-drive trip organised by a great company, then email me at steph@bigworldsmallpockets.com and I’ll send you my top recommendations – simple! 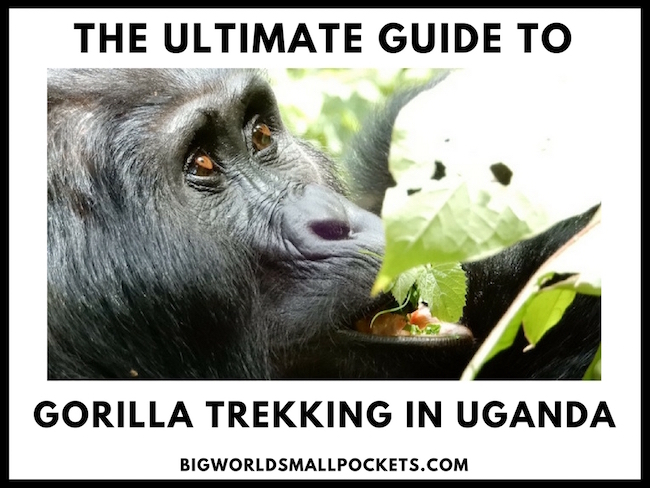 As you may have guessed from the account of my gorilla trekking experience, you’re going need a reasonable level of fitness to attempt this bucket list big one! Not only is that because the distances are long and the terrain tough, but the humidity and heat can be pretty gruelling too. Add into that mix the altitude and the lack of amenities and you want to know what you’re getting yourself into here before it’s too late to back out! Because it can be a long day of hiking, make sure you come prepared for gorilla trekking and have everything you might need for a full 8-9 hours in a comfortable backpack. This includes lunch and appropriate footwear – see more in the section directly below this for full details about what to pack. You’ll also want to have a raincoat on you as it can pretty much bucket down any time of the year here in Uganda and you should expect mud and dampness regardless of the time of year you’re gorilla trekking! I visited in October and while we thankfully had blue skies on the way up to see the gorillas, we got pretty soaked on the way down! It’s also important to be aware, that your whole day’s effort will amount to just one hour spent in the company of the gorillas. Due to important conservation regulations, human time with each family is strictly limited to just 60 minutes per day. It is important to respect this and don’t badger your guide for more time. It’s also important that you don’t go gorilla trekking if you are feeling unwell in anyway – even if you have a cold. Human germs and diseases can prove fatal to these already highly endangered animals. And finally, before your gorilla trekking starts, you’ll be briefed on how to behave around the primates including what to do if they approach you. Pay careful attention to these instructions! Coming prepared to Africa for your gorilla trekking experience is key, as you’re going to struggle to buy many of the supplies here outside of the major cities and sometimes you’ll even have a hard time there! Long, Loose Trousers – These will help to keep you cool, as well as protect from plants and bugs on the hike. Columbia do a great range. Long, Thick Hiking Socks – You’ll need ones that you can tuck trousers/pants in, to safeguard yourself against fire ants! Also a good pair of hiking socks, like these, will restrict your chances of blisters. Hiking Boots – These are an absolute must when gorilla trekking Uganda due to the muddy, wet, slippery and unstable terrain. Make sure you select a pair that have good ankle support, good grip and are waterproof – I always recommend Keen Targhee II. Trainers are likely to get covered in mud in Bwindi and sandals are not allowed. Gardening Gloves – These are optional, but many people like to use them to help protect their hands from the potential splinters of the wooden walking sticks you’re given and / or when clinging to branches on the trek. Long Sleeved Thin Top – With the climate changing quickly here in the rainforest, your body will be warming up and cooling down a lot depending on whether you’re hiking or resting and I strongly advise gorilla trekking in a long sleeved thin top as a result. Long sleeves will protect your arms from the sun, bugs and bushes and will keep you warm; the thin factor will allow your skin to breath and keep you cool too. I actually wore a thin merino top for my trekking, which was perfect and paired this with a thin singlet underneath. Waterproof Jacket with Hood – As I’ve said before, the chances of it raining when you hike to the gorillas is high! Come prepared with a thin, breathable, waterproof jacket that will keep you dry without overheating you. I love North Face’s excellent range. A Good Camera – There’s no doubt gorilla trekking can provide the photo opp of the year, so don’t think your mobile phone will cut it! Instead invest in some decent camera equipment, including a zoom lens, spare battery, cleaning cloth and waterproof case. I love my mirrorless Sony A6000, which is light, compact and sturdy – perfect for the wilds of Africa travel. The 55-210mm lens was ideal for snapping the gorillas and the 16-50mm lens gave me some great wider shots of the stunning landscape. Sunscreen – Goes without saying when you’re this close to the equator! Insect Repellent – This is the tropical jungle people so be prepared! Day Pack to Carry Everything – This one from Hikpro would be ideal! 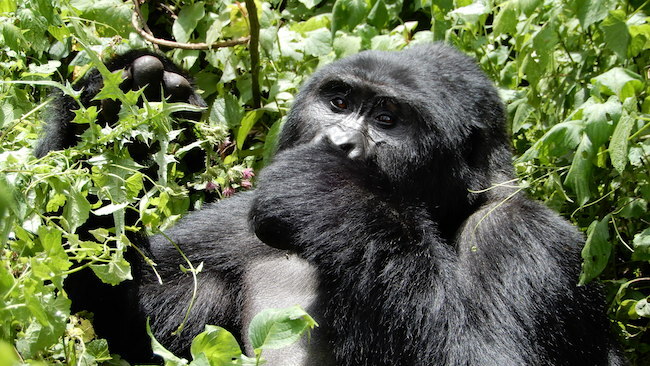 There’s no doubt that gorilla tours in Uganda are an expensive undertaking wherever you do it. Bwindi Impenetrable Forest however ranks as one of the cheapest places, even more so if you visit during the low season like I did. I paid around £500 GBP for a permit – which is definitely not a budget travel ideal price, but I couldn’t pass up this once in a lifetime opportunity and am ultimately super glad I splurged. It’s also important to remember that some of this payment goes to helping local villages, conservation support and sustainable job creation. 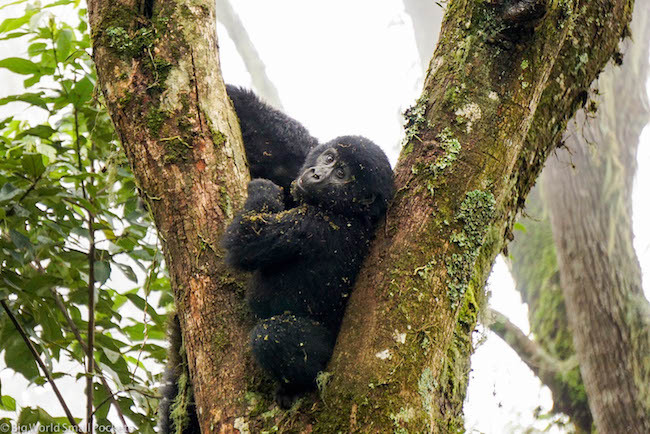 In addition, when you compare this to the price of gorilla trekking in Rwanda – now priced at over $1000 USD, it’s a bargain! Visiting the gorillas in the DRC’s Virunga National Park is cheaper than Rwanda and you get the added benefit of seeing a live lava show at one of the volcanoes here too, so you may want to investigate this option! Do bear in mind that wherever you decide to undertake your gorilla trekking, permits needed to be booked well in advance. I actually got mine through Absolute Africa at least 3 months before I actually made it into Uganda. Please do not rock up therefore and expect to get a gorilla permit for the next day – you will be disappointed. I would never think of travelling to Uganda without proper coverage and always recommend travel insurance from World Nomads who I’ve used during my time in this country and throughout Africa. I love their great coverage of adventure activities – crucial for a country like Uganda – as well as their excellent customer service and ability to claim online, which is very handy if you’re travelling in remote places for a long time. If you’re heading to Bwindi Impenetrable Forest to see the gorillas, then it is possible although pricey, to stay very near the park. My recommendation for budget travellers however is to base yourself in the nearby town of Kisoro instead. 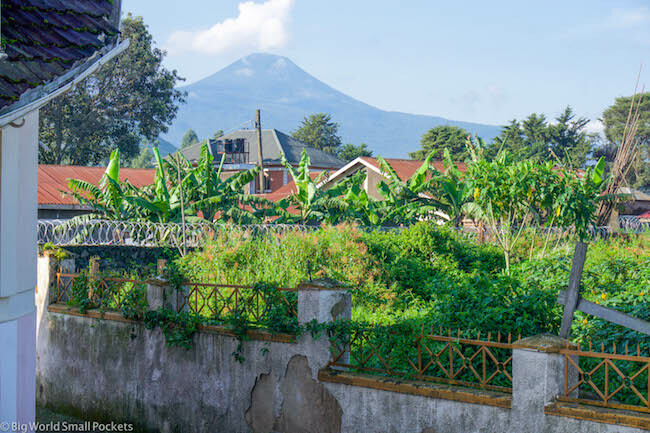 Just across the border from Rwanda and very near the DRC, there’s tons of things to do around this little town, which means you could easily spend a few days here, especially given its dreamy volcano backdrop! 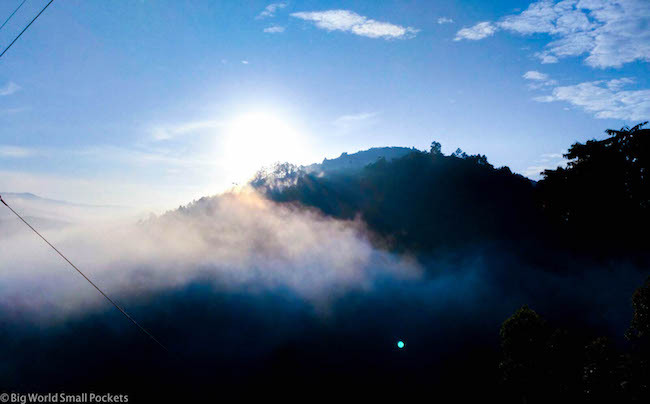 Yes this safe, friendly, one street town offers travellers loads of hiking and wildlife activities including chimpanzee and golden monkey treks as well as gorillas. It’s possible to change money here, which is great if you’ve just come across the border, and there’s a small supermarket to stock up on supplies or grab packed lunch material if needed. Otherwise, the best eating options in town are the Coffee Pot Café – a good expat choice and Miami Hotel – which offers cheap, local fare. 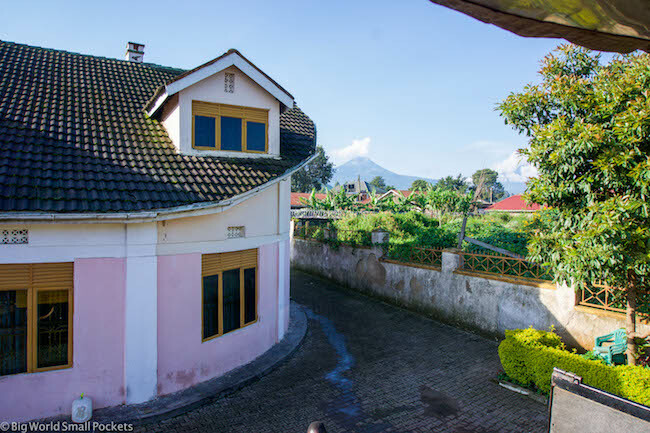 Within Kisoro, I highly recommend staying at Rafiki Guest House, which has private rooms, as well as dorms and a cute little garden space. Read my full review of Rafiki Guest House here. Rafiki Guest House also have a tour company – Iringa Adventure Tours – who can organise gorilla trekking for you. They can also arrange coffee tours, orphanage visits and treks to Lake Mutanda – 3 other popular activities to do in Kisoro. 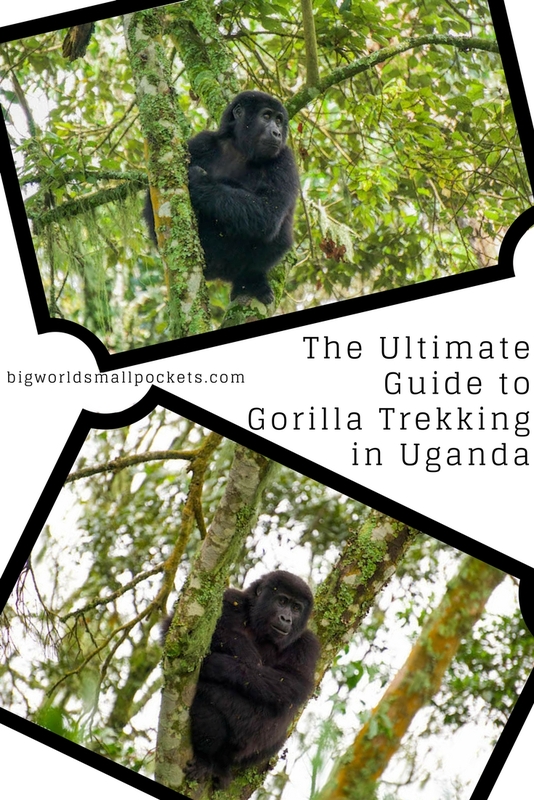 So there you have it, my ultimate guide to gorilla trekking in Uganda. 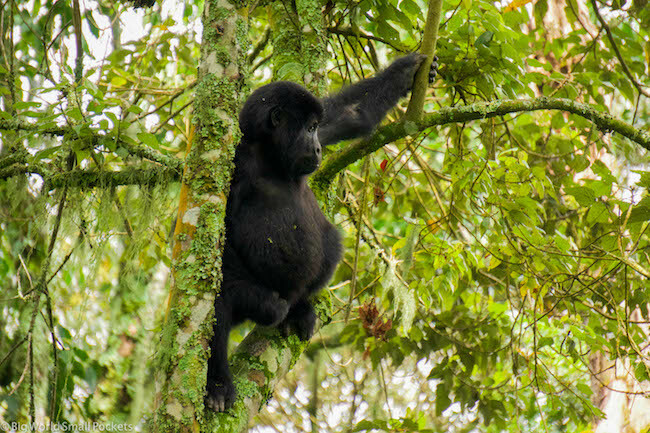 Have you trekked to see the gorillas in Africa? Where did you did it?